ADN is an in-depth visual chronology charting the early life and career of David Bowie. 140,000 words/800 images, it contains hundreds of interviews, a wealth of new information and rare images. It’s a detailed year-by-year account of Bowie’s life from birth to his departure from the UK in 1974. In 1983 Kevin Cann wrote his ﬁrst book, David Bowie A Chronology. In 1988 he co-authored Kate Bush A Visual Documentary. In 1999 Kevin researched and co-ordinated the reissue of Bowie’s back catalogue with EMI and has contributed sleeve notes for various Bowie anniversary releases. A masterpiece! A must-have for every self respecting David Bowie fan. Kevin Cann did a marvelous job on this very detailed book about the Great popstar and did a lo of research. THE best book about David Bowie in THE universe! The last word in detail, rare imagery and full on fan satiating brilliance. In an avalanche of rock books it stands proudly at the top of the pile. Bowie's rise to fame charted in detail and illustrated with stunning photos...every fan deserves a copy. Captivating, couldn't put it down. Absolute riveting read and an absolutely invaluable reference book for any learned followers of Bowie will dip into again and again - Its a rock bible ! This is an absolutely fabulous book which everyone would enjoy reading and find facinating - you absolutely don't have to be a Bowie fan to read it. I have the Limited Edition copy which is a must have! Love it!!! A super detailed and honest account of this period in Bowie's career. This is not just for Bowie fans, but all music history lovers. Kevin Cann's best book to date. Fantastic, in-depth coverage of Bowie with wonderful, previously unseen pics. A must for all Bowie fans. An intricate treasure trove of facts and photos. Obviously a labour of love for author Kevin Cann - the passion for his subject is evident on every page. 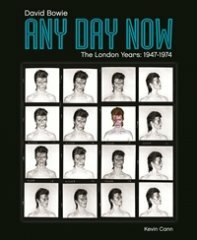 ANY DAY NOW is a must-have for Bowie fans and any one interested in pop history. A wonderful account of a footnote in the history of popular music. The wonderful images compliment the detailed account of a man striving to get his talent recognised. Truly excellent!